In the summer of 2017 it was announced that Hatfield Forest parkrun [venue blog], in Essex, would be closing down. 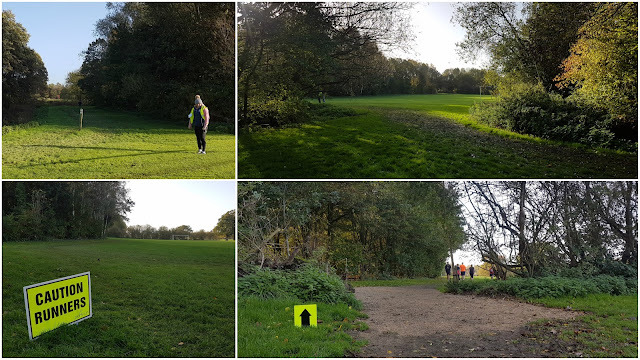 Heartbreaking news to parkrunners near and far to be losing a run in such a special location, however this pristine forest area had served the parkrun community well and it was time for the event to move on. So in September 2017 Hatfield Forest parkrun held its last event. Seven days later, like the mythological phoenix, a new event rose from its ashes. 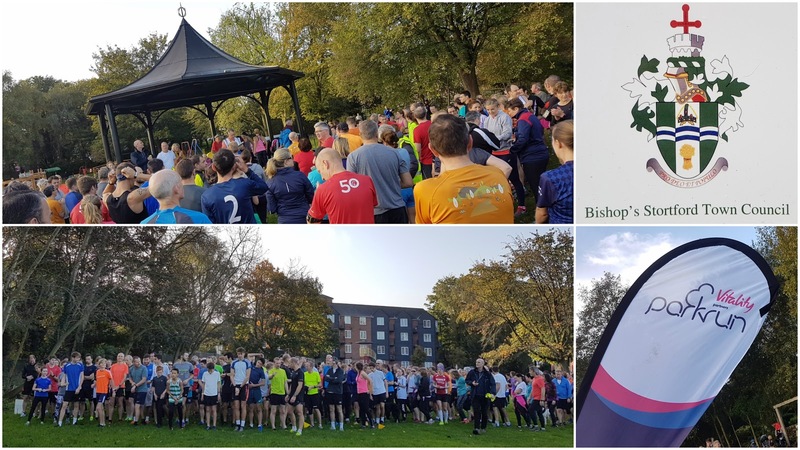 It is called Castle Park parkrun and takes place in Castle Park and Grange Paddocks which are green spaces in the historic town of Bishop's Stortford. The town is 5.7 miles (by road) or 5 miles (as the phoenix flies) to the west of Hatfield Forest. As well as moving physical location, the event also changes from being an Essex parkrun venue to being a Hertfordshire parkrun venue. Bishops Stortford currently has a population of around 38,000 people and has grown around the River Stort. Known in Saxon times as Steort-ford (the ford at the tongue of the land), the town actually gave its name to the river when 16th century cartographers assumed that Stortford must have been named after it. The Bishop's part comes from William the Norman, Bishop of London, who bought Stortford Manor in 1060. Around the same period, a motte and bailey castle 'Waytemore Castle' was constructed - this was improved over the centuries and the Grade I listed remains of the 12th century rectangular tower can be seen atop the mound in Castle Gardens. You can't currently access the mound itself, but plans are being put in place to provide some kind of access to this historic site in the future. On the subject of plans, the park is currently undergoing a bit of a transformation thanks to a successful application to the Heritage Lottery Fund. There are two different areas that make up the park and these were historically managed as completely separate spaces. 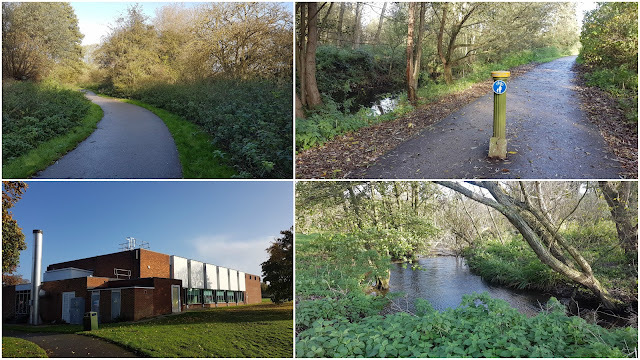 A joint effort between Bishops Stortford Town Council and Hertfordshire County Council has recently lead to the formation of Castle Park which brings together Castle Gardens and the adjacent Sworders Field. Sworders Field contains many traditional park elements such as a bandstand, children's playground and skate park. It was gifted to the town by local businessman Joe Brazier in 1928, but the field itself is named after Herbert Sworder who, upon his death in 1933, bequeathed the town £450 for a children's play area in the centre of the town, which was formally opened in 1951. 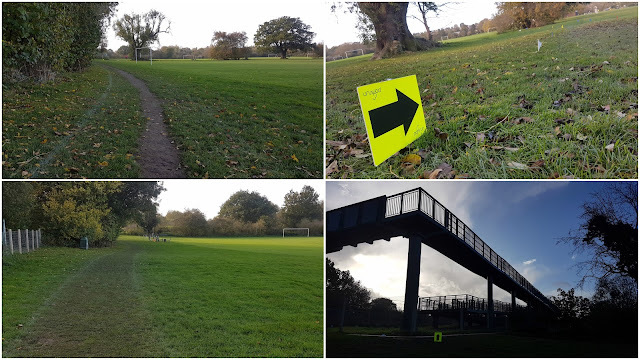 This area provides the start and finish for Castle Park parkrun. I visited this venue and ran at their 4th event, I travelled by car and parked in the adjacent Link Road pay and display car park. There are plenty of other parking options including the Causeway car park, but the official venue course page specifically requests that a few other specific car parks are avoided. Had I travelled by train, Bishop's Stortford station is only about five minutes walk away. I didn't see any cycle racks in the park, but there were some across the road outside the library. There are currently no toilets in the park, so a trip across into the town centre is necessary if you require use of the facilities. The Jackson Square shopping centre is recommended as the best place to go - the toilets here are on floor 0, however they were closed when I visited. The second recommended option is Sainsburys which is in the same shopping centre. Fortunately their toilets were open when I visited. It is also worth noting that the lottery fund cash for Castle Park does include a plan for new toilet facilities to be built. The run briefing takes place at the bandstand in Sworders Field, and after this the participants form on the start line adjacent to the train line. The course here is flat and made up of a short start tail followed by two full clockwise laps. At the end of the second lap the runners head back onto Sworders Field for the finish. Underfoot is a mixture of grass and tarmac, however there is more grass than tarmac and it will be pretty muddy during the winter. The lap itself follows the shared-use tarmac path (watch out for the waist-high posts in the centre of the path) adjacent to the River Stort all the way up to the Grange Paddocks Leisure Centre at which point the course transfers to grass and follows what is officially a grass running track which circumnavigates Grange Paddocks - from what I can see this grass area is not technically part of Castle Park. Grange Paddocks seems to have previously been part of the grounds of The Grange, a large house owned by Sir John Barker of the Barkers department store in London and is still a separate area to the park. Grange Paddocks is laid out with about half-a-dozen football pitches, but around the edge of the open grass field is the aforementioned running track - it's essentially just a slightly mowed grass path which meanders around the field. It is marked with two parallel white lines which make it easy to follow. The parkrun course breaks away from the marked path at the far north end of the course and again follows the river for a short stretch - it was already very muddy around here. The section around Grange Paddocks does require some self-discipline as it is very easy to cut the corners. After turning and heading back to the south, the course follows the train line back towards Sworders Field. As it leaves Grange Paddocks, underfoot returns to tarmac and there's a chicane to negotiate next to large, imposing, metal footbridge. The path then leads the participants past a playground and the skate park back to the beginning of the loop. Once a second lap has been run, the course turns back onto the open grass area where it heads back through the start and loops round in front of the bandstand until reaching the finish funnel.